The Cavision 4 x 5.65" Evening Blue 2 Filter adds a lavender blue coloration across the entire image and simulates the lighting quality as if the scene were lit by moonlight. The richness of the blue color is lighter than that of a Day for Night filter, making it well-suited to use in more dimly-lit conditions. The 2 color density provides less blue coloration than the 3 density, but more than the 1 density filter. This filter is made from optical glass for maintained image quality and measures 4 x 5.65" / 101.6 x 143.5mm. Lavender blue-colored filter provides a rich overall coloration and helps to simulate the look of moonlight. 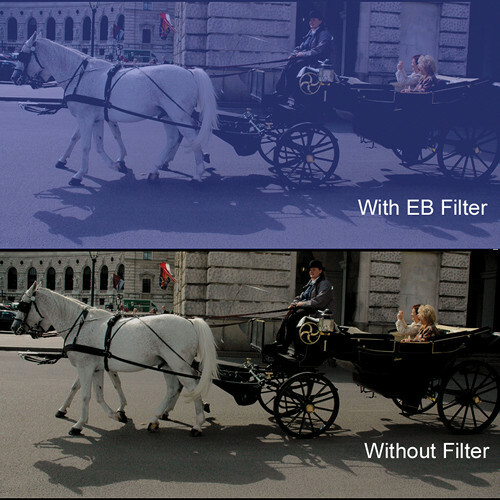 Lighter blue than a Day for Night filter permits easier use in dimly-lit conditions.